This is a complete rewrite of an earlier version which was lost due to a hard drive crash a couple years ago. 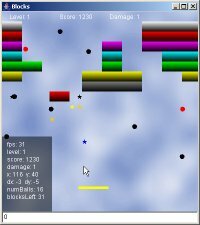 The original version was written as a Java applet, where this new version is designed with making an applet and an application version. 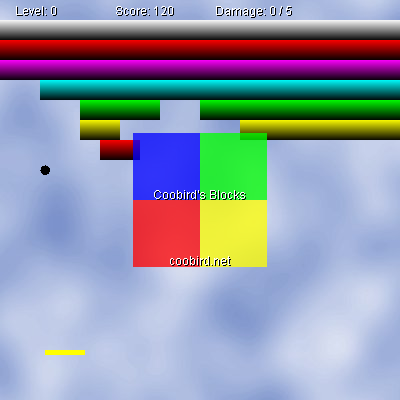 Two one-minute MPEG videos of the development version of Coobird's Blocks in action is available for download. 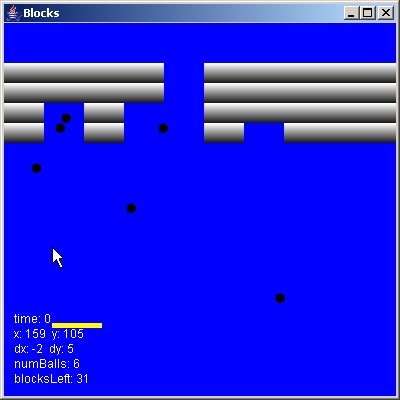 Both demonstration videos shows the game running with "tweaked" settings such as increased probability to get an extra ball awarded (hence, the "explosion" of balls showing up) and allowing many balls to appear at once early in the game. 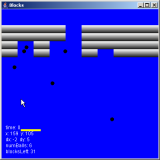 Also, only a simple version of the level generator is implemented, so only a new row of blocks is added after reaching a level. Although the video of the game is jerky, it is due to the lack of processing power during the screen recording. The actual frame rate is approximately 30 frames per second. The first video lacks a background (captured on April 17, 2008) and colored blocks while the second version (April 23, 2008) has those two features. The level generator has been improved to provide more dynamic levels. The current release, version 0.1, is superficially very similar to the Blocks in the second video. The videos were captured using CamStudio, a free screen recording application. The videos were encoded to MPEG using TMPGEnc.